Benjamin Alexander Schilling, the box-owner of CrossFit 27, is giving us a little insight into what happens at his BOX! Enjoy another episode of our Europewide BOX interviews. I was working in a conventional gym as fitness and personal trainer when i found a few crossfit videos in the internet, that was at the beginning of 2011. On that time I was specializing on functional training, and when I found crossfit and started to use it for my training I knew it is the best way of fitness I had known. A few month after I did my crossfit L1-cert, and after using crossfit as training method for my clients, seeing that they enjoying, having fun and good results, I asked myself, why not opening the first Crossfit Box of Tenerife? In May 2012 it came true. Apart from the 1200m² space, open box any time, and classes starting every hour nonstop all day long, we are proud of our good community, everybody is invited to be part of CrossFit27, learn new people, make friends and feel like home doesn’t matter where you come from. Now we are more than 100 members, around 30 % female. Ages between 17 and 50 years old, mostly between 25 and 35 years. We start to have around 10 competitive athletes, we are anxious for the next opens! We only offer crossfit classes or open box. We are planning to offer olympic weightlifting classes too. Yes, we don’t make strict diet plans but we try to give our members the best info and recommendations about the paleo diet. We scale down all our workouts in 3 levels, the beginners start at the basic level that means low weights and basic exercises for the workouts. After dominating the basic exercises like squats, deadlifts, pull-ups… and feel comfortable with the weights they get to the next level. Yes, we think that internal competitions are fun and a good way to prove the athletes fitness. We also do it to find out our fittest athletes to make a team for the next games. Yes, because Tenerife is a high touristic place crossfitters of all countries visit us and we make good contacts. We also have a good relation with the other boxes of the Canary Islands: Crossfit TNF, Crossfit Mente, Crossfit Canarias and Crossfit Lanzarote. 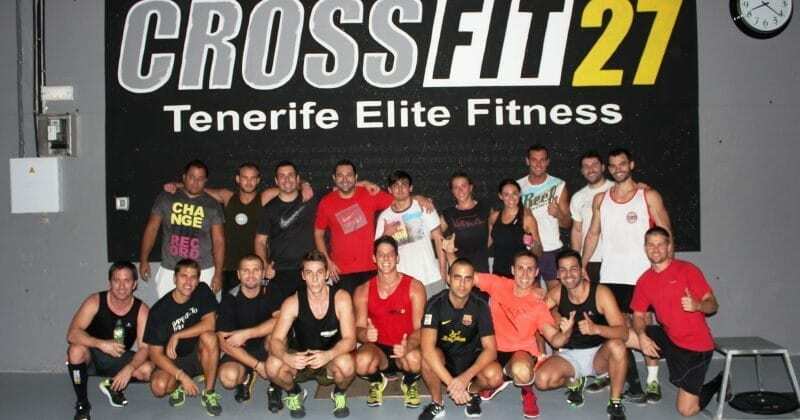 Yes, if you are in Tenerife, training at CrossFit27 is a MUST! We are very happy to receive you all! Write us via contact form on www.crossfit27.com.